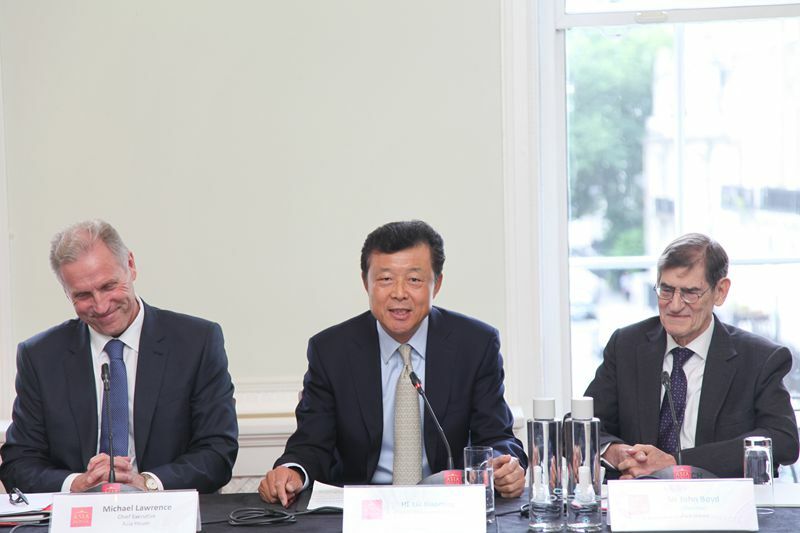 On 5 August, Chinese Ambassador Liu Xiaoming attended Asia House Breakfast and delivered a speech entitled Embrace the 'Golden Time' for China-UK Relations. 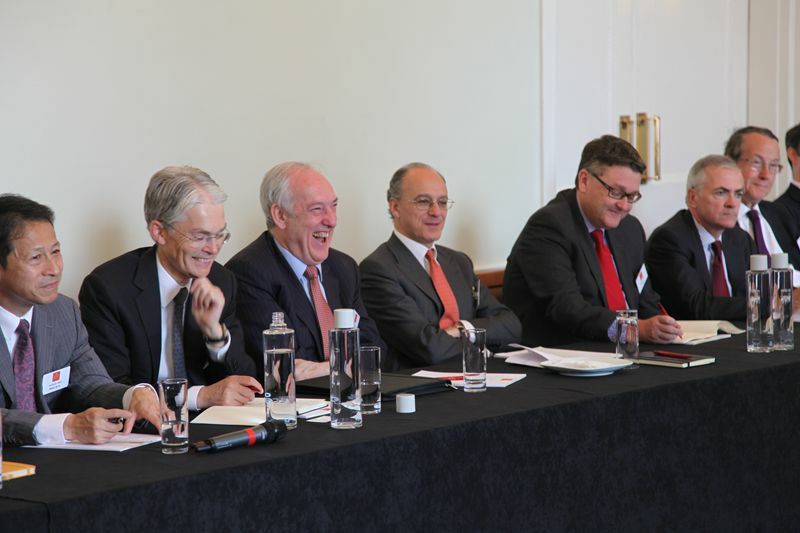 The breakfast meeting was hosted by Michael Lawrence, Chief Executive of Asia House, and was attended by Sir John Boyd KCMG, Chairman of Asia House, Lord Sassoon, Chairman of the China-Britain Business Council, and executives of over 50 large British businesses and multinational companies such as Aruba Group, Barclays Bank, HSBC, Standard Chartered Bank, Royal Dutch /Shell Group of Companies, BP, Anglo American plc, Diageo, Bupa, McKinsey & Company, Prudential plc, Rio Tinto Group and Linklaters LLP. In his speech, Ambassador Liu pointed out the year 2015 is no ordinary year. In February, Prime Minister Cameron referred to the year 2015 as a "Golden Year" in his Chinese New Year message. He later went on to envision a "Golden Time" for China-UK relations in the coming five years. This depiction gradually became a consensus between Chinese and British leaders. It was quoted by both sides on many occasions. China and the UK have now agreed to jointly initiate a "Golden Time" for the bilateral relations. As Ambassador Liu noted, there are three main indicators of a "Golden Time". The first indicator is the increasingly strong political mutual trust between China and the UK. In this year, the Duke of Cambridge paid his very successful visit to China. This was the most important royal visit to China in nearly 30 years. Shortly after the new UK government was formed, Prime Minister Cameron was on the phone with Premier Li Keqiang. The two leaders agreed to work together to bring China-UK relations to a new and higher level. Another indication of the 'Golden Time' is the huge progress in economic, trade and financial cooperation. This can be seen in a succession of good news since the beginning of the year. China-UK trade in goods totaled 36.74 billion US dollars in the first half of this year. China has thus become the UK's fourth largest trading partner. In turn, the UK has become China's second largest trading partner in the EU. The third indication of the "Golden Time" is a kaleidoscope of cultural events and people-to-people exchanges. 2015 is Year of China-UK Cultural Exchange. The UK Season in the first half of 2015 has come to a successful conclusion. Now is the time for the China Season, entitled "Creative China". The China Season will roll out a rich variety of events across Britain. The British public will be treated to a feast of classic, modern and contemporary art works and events brought from China. "Creative China" will produce a bumper harvest for China-UK cultural exchange and cooperation. Quoting the American author Mark Twain as saying "The golden age is before us, not behind us", Ambassador Liu said that an even better future for China-UK relationships unfolding right before us. In the "golden" month of October, President Xi Jinping will pay a state visit to the UK. This will be the first state visit by a Chinese President in ten years. The historic significance of this visit cannot be overstated. It is expected to mark a new milestone and herald a "Golden Time" for China-UK relationship. The peoples of our two countries cherish high hopes for the state visit in October. We are ready to join hands and work with our British colleagues to ensure a complete success of this visit. Together, let's embrace the "Golden Time" of China-UK relations. After the speech, which was well received, the Ambassador answered questions from the audience. 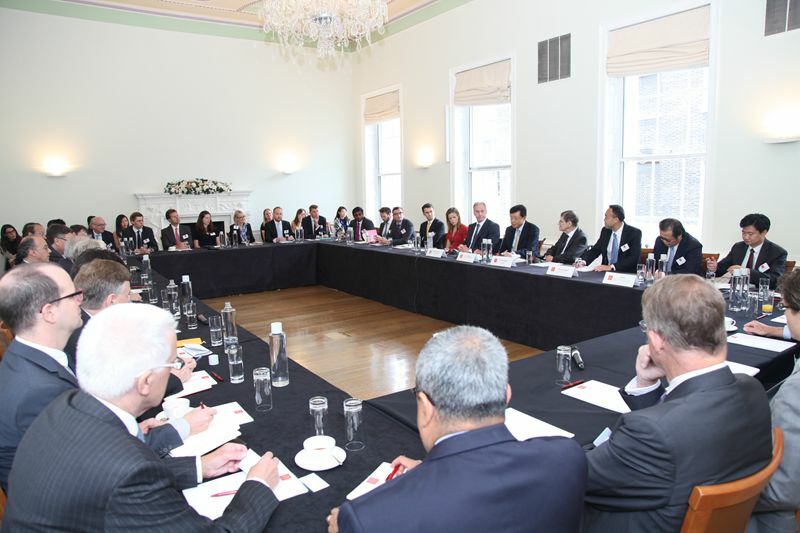 When asked about how China and the UK will cooperate under the framework of Asian Infrastructure Investment Bank (AIIB), Ambassador Liu said that the UK's application for AIIB membership as the first Western countries to do so was a demonstration of the vision of the British government, the importance it attached to Asia and its willingness to strengthen economic and trade relationship with Asian countries. Recently, UK Treasury Minister Jim O'Neill signed AIIB Agreement in Beijing on behalf of the British government. The UK has rich experience and advantages in infrastructure investment and financing, and the Chinese and British sides can cooperate in various areas such as trade, investment and financial cooperation for mutual benefits and regional interconnectivity and economic development. When talking about what opportunities the Northern Powerhouse initiative will bring to the China-UK trade and economic cooperation, Ambassador Liu said the Chinese side attaches great importance to this initiative, and expects to take an active part in it. At present, the two sides are having discussions in relation to the project of Airport City Manchester and the second phase of high-speed rail project. We hope concrete outcomes will be achieved. On China-UK cooperation on RMB Internationalization, Ambassador Liu said since London launched offshore renminbi market in 2011, the UK has made history in various areas, including signing currency swap agreement, getting initial RMB quota as Qualified Foreign Institutional Investors, issuing renminbi-denominated financial products and renminbi bonds, setting up RMB clearing bank and approving Chinese bank branches in the UK. In 2014, overall forex trading volumes jumped 143% over the previous year, with an average daily volume of 61.5 billion US dollars. The daily spot trading volume reached 18.4 billion US dollars, more than three times that of 2013. In this year, the first RMB money-market fund, China Construction Bank ETF, began to be traded on the London Stock Exchange. Deeper China-UK financial cooperation will not only enhance the position of London as an international financial centre but also contribute to RMB internationalization and trade and investment liberalization and facilitation. On people-to-people exchanges between China and the UK, Ambassador Liu said the two countries have witnessed dynamic people-to-people exchanges. According to preliminary data, in the past five years, the number of Chinese students in the UK increased to over 30,000. The UK is Europe's largest and world's second largest destination of Chinese students. At the same time, China is open to more British young people pursuing studies in China. According to the plan by the British government, over 80,000 British students will participate in academic study or take up internships in China by 2020. 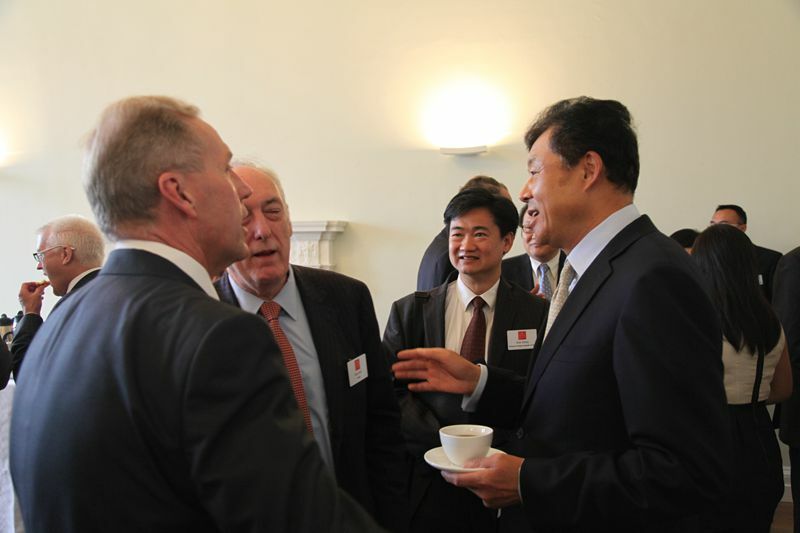 Closer personnel exchanges will help advance China-UK economic and trade relations. When asked about whether a EU referendum will have a negative impact on China-UK trade and economic cooperation, Ambassador Liu said it's still too early to discuss the impact of a referendum. China supports a united and prosperous European Union, and hopes to see the UK play an important role in the EU. The decision as to whether the UK should stay in or leave the EU rests ultimately with the British public. 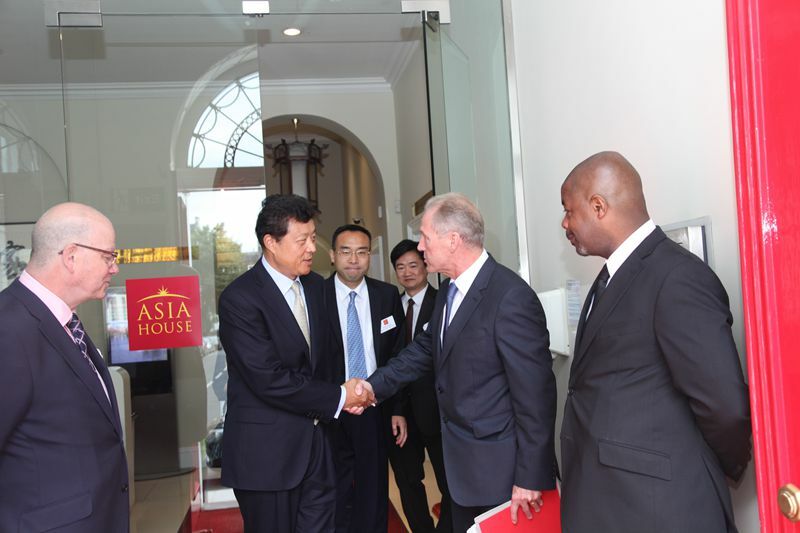 China is committed to developing stable and healthy long-term relations with the UK. This position will not change. Ambassador Liu also answered questions on the LSE listing of Chinese companies, bilateral visa arrangement, green industry and cooperation on education. Chairman Sir John Boyd said in his speech that the breakfast meeting was a great success as it provided a valuable opportunity for British businesses to gain insight into China-UK relations. Ambassador Liu's speech and the Q&A session have been enormously informative and inspiring. He gave his best wishes to China-UK economic and trade cooperation to reach higher levels and to contribute to the growth of bilateral ties. China and the UK should work together and share the opportunities presented by a prosperous Asia. Asia House is a British non-profit organisation that aims at promoting trade and economic development and cultural communication in Asia. Its members are mostly renowned institutions, large corporations and leaders of various strands of the British society.